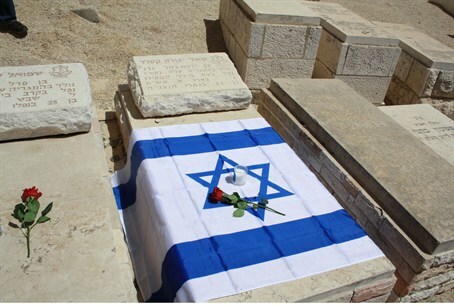 As Israel prepares to begin its Yom Hazikaron [Memorial Day] observance on Tuesday evening many bereaved families are reminded their lives contain a vacuum. One such famlily is that of former Lt. Colonel Yehuda Ben Shabbat, who served in the IDF Northern Command until he unexpectedly died of a heart attack eight years ago. Father, son, husband, and brother - Ben Shabbat's tragic passing affected three generations in profound ways. Natalie Leiba, Ben Shabbat's sister, told Arutz Sheva that every year Yom Hazikaron presents a difficult emotional challenge for the amily. "It's horrible for us," she said. "Not just Memorial Day, every year. It's like a nightmare. Life changes dramatically, and then the holidays are no longer holidays." "You feel the void, especially in the case of person who played a powerful role in our lives and united the whole family," Leiba said. "We have not referred to what we were," she said. "Mother is not mother. She was strong, but today she is a wreck, and father died of grief at 63." "I lost an amazing brother," she said. "Every year at this time I lose focus for a few days. I cannot think of anything else. The memories well up. It is impossible to describe the loss." Beginning at sundown on Tuesday, Yom Hazikaron will continue until sundown on Wednesday, when Israel's 64th Independence Day celebration will begin.